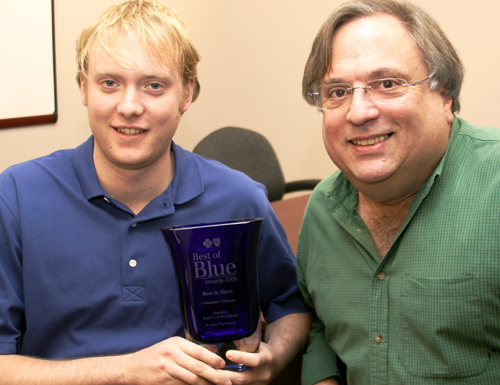 Emerging Markets Director Francisco Garbayo (right) and Jonathan Rudolf, Coordinator, were honored with the "Best of the Blue" national award , recognizing the success of their efforts in reaching out to the Latino community. Francisco Garbayo serves as the Emerging Markets Director for Regence, covering the four-state region that includes Washington, Oregon, Idaho and Utah. He is responsible for implementing strategies and programs to engage the Latino community, by breaking down the linguistic and cultural barriers that make it difficult for many to understand the health insurance system in the United States. Prior to his involvement at Regence, Francisco worked in top leadership posts in leading human resources functions for company startups and turnarounds. Originally from Cuba, Francisco immigrated to the United States as a political refugee as a teenager. In a Q&A with Colors of Influence, Francisco discusses Regence’s programs geared toward Latino communities. 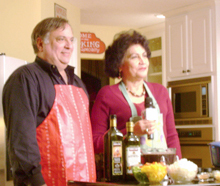 Francisco and Nelly (Cita con Nelly) filming a healthy cooking show. What is your primary charge as the Emerging Markets Director for Regence? Regence is a not-for-profit organization that is committed to improving the health of our members. For us, an emerging market is one that is underserved and under-represented. The first market that we identified is the Latino market, which is truly underserved. We’re interested in building long-term relationships with our members. We felt that focusing on this community would help us build stronger relationships and provide a value to the Latino community. The Latino population is the fastest growing group in the U.S., and it is estimated that by 2010, the Latino population in Regence's service area will reach 1.5 million people. There are a total of 24,626 Latino owned businesses in Idaho, Oregon, Utah and Washington, and 60 percent of business owners are of Mexican origin. The Latino market in our footprint is fairly young. We have members that hail from all parts of the Latin world, but the bulk of our members have Mexican roots. The Latino community is tightly-knit, and members have a very strong desire to help each other. Our approach is through education. We looked at the issues relative to access to care, and found that a huge barrier is lack of understanding about how health care works in the U.S., especially among immigrant populations. Why is it important for Regence to engage the Latino community? We know that people who don’t have access to health care have more health problems. If people don’t have access to prevention, the cost in human suffering and human capital are sure to increase. Our goal is to provide access to care before people’s conditions become worse. We want to engage the community by focusing on prevention, and not waiting until they’re too sick to be able to fix anything. What characteristics are unique to Regence’s Latino market? We found that Latinos tend not to think of health care as a commodity – something that needs to be purchased. As most Latinos come from countries that have a socialized healthcare system, many of the concepts such as a premium or a deductible, are foreign. I’ve talked to employers that offer health care coverage for their employees, and they have found that some of their Latino employees choose not to have health coverage. We come in and talk to Latino employees and explain how the health system works. It’s good to be able to explain the importance of health insurance coverage, so that families have access to care. Regence and Big Brothers Big Sisters team up to host an event for Latino youth and mentors. What strategies have been effective in building stronger relationships with Latino members? Latinos are loyal customers who identify with people-centric brands. What makes Regence different is that we focus on the member experience of our product, not just the messaging. We want to market the touch and feel of our experience since Latinos gravitate toward more intuitive, emotional, symbolic, service-driven brands. Instead of relying on products to make them happy, Latinos prefer products that enhance the experience of spending time with family and friends. Regence understands and respects this cultural diversity when dealing with our Latino members as we have focused on shifting from a transactional way of dealing with our members to a relational and interactive exchange. Being able not only to translate materials, but also to “trans-create” materials is important. We created member materials that are sensitive to the culture and values of the Latino community. What program successes are you most proud of? Last year, we launched our “Consejero Latino” (Latino Concierge) program, a bicultural and bilingual service that is free of charge to our members. It provides a true full-concierge model that allows members to access the entire tree of health care departments and options, all in one quick phone call. The “consejero” offers links to Regence departments, health care providers, hospitals: all the players in the health care system. The “consejero” not only helps interpret information, but serves as a “personal navigator” for our members through a complex health care system. Another key component to providing a quality Latino member experience is making sure the health care system is easy to understand. Concierges who are happy to spend time explaining any concept in everyday language, in English or in Spanish. It’s important that our members understand their summary of benefits, including the legal aspects and pharmaceutical terms. That’s why we’ve produced a glossary of terms in English and Spanish. Rather than reinventing the wheel when it comes to effective strategies in engaging our members, we partnered with community leaders and thought leaders in mutually beneficial ways to carry our message of health and wellness to the community. We also focus our education to help members explore how life is different in the U.S., versus different countries of origin. We share information about how people can maintain a healthy lifestyle in the U.S.
What are some of the most challenging aspects of the outreach? We haven’t encountered many challenges; it’s been a real fun journey. I’d say the challenge for us is that we’re managing the emerging markets division across four different states. Our straightforward approach, which focuses on engagement and education, has been really successful. What I enjoy most about the work is being able to have an impact on a significant number of individuals. In our efforts education, we make a difference in people’s lives.